Audi's Beijing show crossover concept has traditional Audi styling cues including a clamshell style hood, prominent wheel arch flares, and a heavily curved roof line. Audi has released sketches of a new TT-inspired crossover concept that will debut at the Beijing auto show later this month. 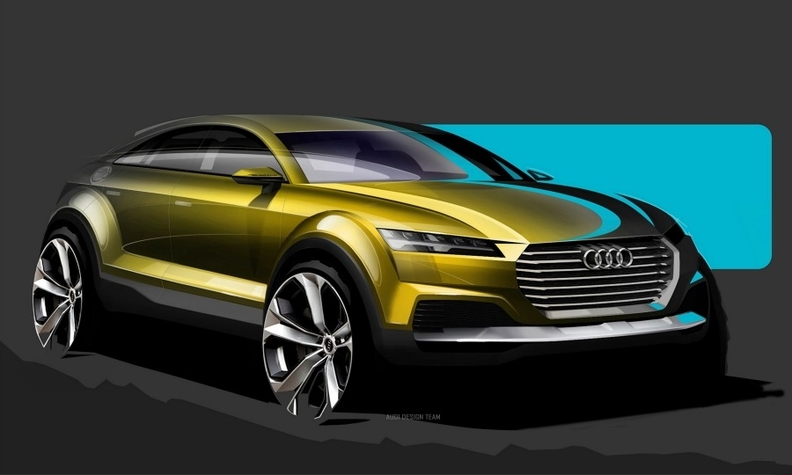 The high-riding crossover is rumored to preview the upcoming Audi Q4 -- Audi's answer to the BMW X4 and Porsche Macan. The five-door model shares design cues with the three-door Allroad Shooting Brake unveiled at the Detroit auto show in January, suggesting Audi is already well advanced on a series of new sporting crossover-style SUV models that will line up alongside the more practical SUV offerings already on sale. As with the Allroad Shooting Brake, the appearance of Audi's latest concept is heavily influenced by that of the new third-generation TT. It is close to the existing Q3 in size. The Beijing concept has traditional Audi styling cues such as a prominent six-corner single-frame grille, trapezoidal shaped headlamps with complex LED internal graphics, clamshell style hood, prominent wheel arch flares, a heavily curved roof line, high waistline and shallow glasshouse. Inside, the new Audi concept provides seating for four in individual seats – those at the rear appearing to fold flat to extend luggage capacity. 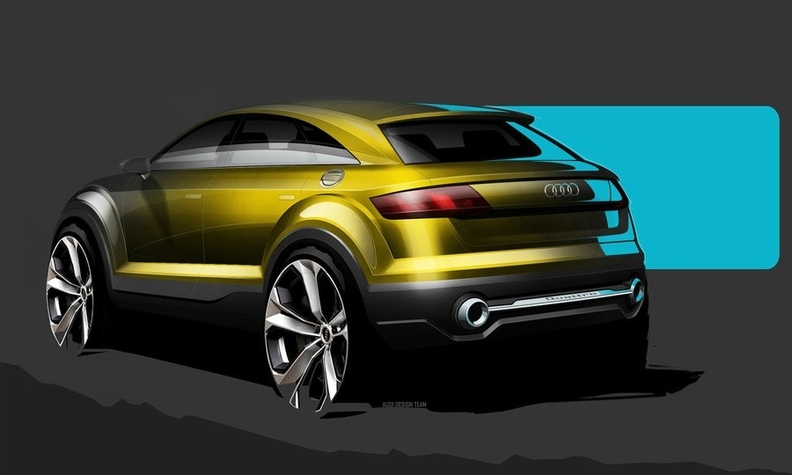 The Audi crossover concept is rumored to preview the Q4 SUV, a potential rival to the BMW X4 and Porsche Macan. Powering the new Audi is a plug-in gasoline-electric hybrid drivetrain similar to that seen on the Allroad Shooting Brake. It consists of a transversely mounted turbocharged 2.0-liter four-cylinder combustion engine and a pair of electric motors – one integrated into a double clutch gearbox and another mounted within the rear axle. Together they provide the concept with four-wheel-drive capability. In a development not seen on Audi's earlier concept, the crossover headed for Beijing showcases an new inductive charging system for its lithium ion battery. Speaking to AutoWeek recently, Audi's head of research and development, Ulrich Hackenburg, suggested Audi was pursuing a strategy that would see it extend its lineup with new crossovers rather than traditional minivans. “There is a clear trend towards crossover style vehicles in nearly every market we are represented. We are well aware of this and intend to take advantage of it,” he said.